Find the most appropriate contract for reliable data and voice connections using our online contract builder. You'll be able to connect to a package that suits your requirements whether you're a sole trader or procure hundreds of phones for corporate personnel. Choose from a vast array of handsets on all the popular operating systems, including Android, Apple and BlackBerry, to stay in touch with the office whilst on the move. We cover all the major and independent networks and include complimentary Wi-Fi hotspots in all plans. 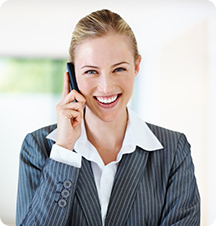 Telephone BusinessMobiles.co.uk on 0800 690 6589 or use the online form for prices from all the UK networks. Which Handset Should I Choose? All handsets should be able to connect to your office email accounts to send and receive messages and browse the web either via your data package or at Wi-Fi hotspots. If you require access to your proprietary business applications, then seek professional guidance for advanced integration services. Mostly it's down to personal preference and availability. Read our guide to all available handsets including the business developed BlackBerry phones as well as award-winning phones from Nokia, Apple, HTC and Samsung on the various operating systems. A strong, reliable signal and fast access are vital when on the move. Most businesses choose a network where they receive a four or five bar strength in their premises and at locations they visit most often. Most investment in network coverage occurs in major UK towns and cities rather than rural areas. You may experience dropped calls and slow data downloads if you're outside major service areas. Check your speed and access on the five main operator's websites to see which are strongest in your area. Price also plays an important part in the decision-making process, although competition in the market has seen prices plateau and similar across most providers. Most plans provide free handsets, with some networks offering tablets. Most networks also offer bundled packages that include internet access for office broadband. The Three network also offers shared plans in addition to the four main service providers. We are platinum and premium partners with all networks ensuring you the best quality customer services by dealing direct. Use our deal builder to find options for your perfect solution. What Can Smartphones Provide my Business? The new generation of Smartphones has many functions already built into the handsets. 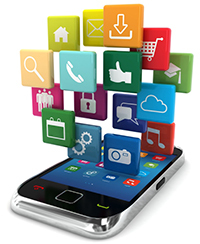 You can access additional functionality from the Apple App Store, Google Play, Samsung Apps or Windows for Microsoft operated handsets. These can help manage your time, log expense claims, book flights and hotels or integrate with your accounting software. Mostly these phones can instantly inform you of new emails much like incoming texts. Attachments such as documents, PDFs and spreadsheets can be read and responded to without the need for additional software. You'll receive a large amount of memory and storage capabilities. If these are insufficient, you can store data on various external cloud secure storage facilities. Eight years experience in the corporate marketplace. Exclusive BusinessMobiles.co.uk pricing on monthly contracts. Impartial of any network with UK call centres. Mention reference AZ199R28 to enable web-based pricing without any surcharges. The industry regulators are Ofcom, who ensures fair play amongst operators and suppliers. The Police Crime Unit has information if your mobile phone gets stolen and you need to report a theft, while the NHS site has research data on using your devices safely. Additional information provided by Citizens Advice has helpful tips on choosing the right provider.